80. 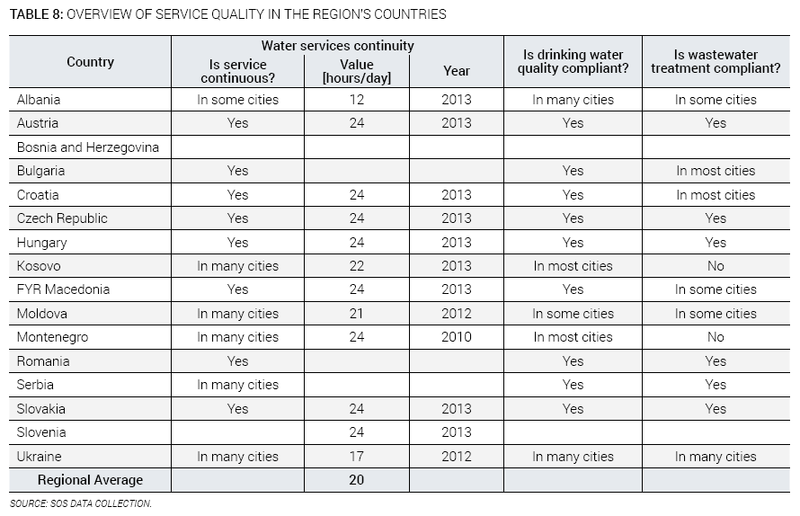 In many of the region’s countries, water service is generally continuous, and drinking water meets national quality standards. There are, however, exceptions, most notoriously in Albania, where many of the utilities do not provide continuous supply, and in Moldova, where drinking water quality is an ongoing challenge. Wastewater treatment plants, where operating, generally also fulfil the requirements issued in the licensing permit, except again in Albania and Moldova, and in Kosovo and Montenegro, where wastewater treatment has largely only recently been introduced. Table 8 and Figure 34 provide an overview of the situation in the different countries for which information is available. 81. Customer satisfaction is, unsurprisingly, higher where service quality is higher. 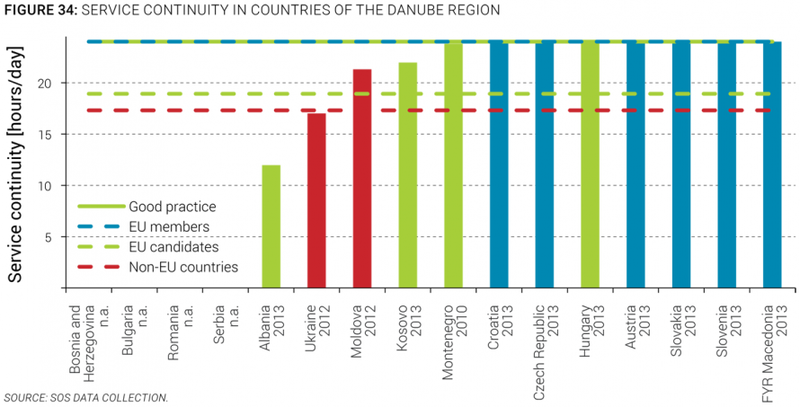 According to a 2013 Gallup poll, customer satisfaction with water and sanitation services in most countries of the Danube region is lower than the EU average, with EU members faring better than candidate countries and non-EU members (Figure 35). Perhaps not unsurprisingly, customer satisfaction is also relatively closely correlated with overall service performance as measured by the Water Utility Performance Index (see Section C in this chapter for more details). 82. Customer protection mechanisms are somewhat underdeveloped in the region, particularly in countries without regulatory agencies. In about half the countries in the region, the law mandates that utilities have an internal customer complaint redress mechanism; however, few utilities voluntarily conduct customer satisfaction surveys, with the exception of privately managed utilities in Bulgaria and the Czech Republic, for example. Those countries that do not have independent regulatory agencies generally do not offer an external institutional mechanism to address complaints or evaluate customer satisfaction. 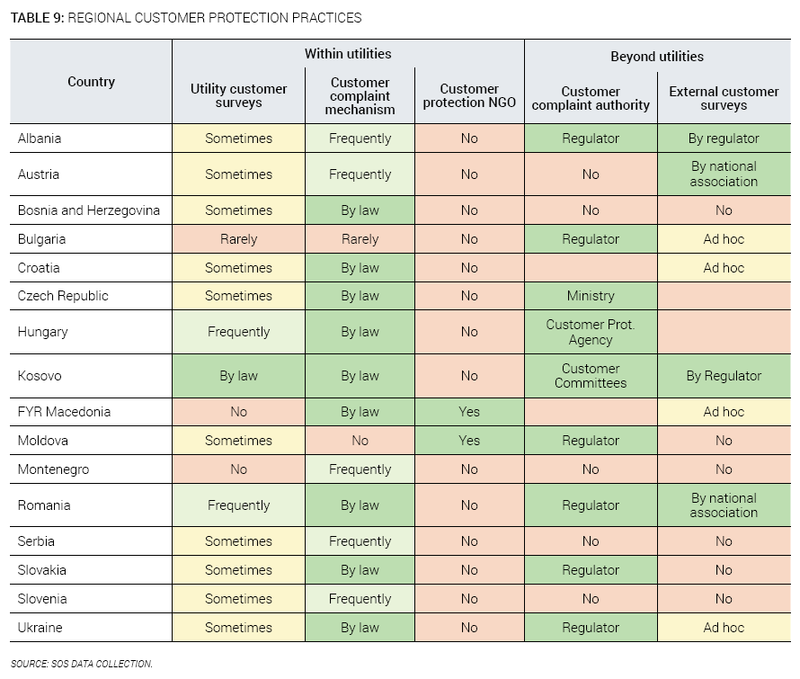 Among those countries with an established independent regulator, almost all provide a formal customer complaint mechanism through the regulator, but few have more comprehensive customer protection practices. In fact, only Albania, where the regulator was established almost 20 years ago, reports the use of tools such as public hearings for tariff setting, as well as the signing of formal contract service agreements between utilities and their customers (Table 9). Requirements for drinking water quality reflect transposed requirements from relevant EU directives (Directive 98/83/EC on quality of water intended for human consumption), and CEN (Comité Européen de Normalisation) standards are transposed into national legislation in all EU member countries, while non-EU countries that are aspiring to become EU members are gradually aligning their national norms and requirements with EU requirements (Albania, Macedonia, Montenegro). The only exceptions to this rule are Moldova and Ukraine, where national drinking and wastewater discharge requirements are defined by national legislation based on old Soviet Union standards. Requirements for wastewater treatment and discharge as prescribed by relevant EU requirements (Directive 86/280/EC, 86/278/EC and 91/271/EC) concerning urban wastewater treatment (UWWTD) have been transposed into national legislation in all EU member countries. Some countries, like Austria, have adopted national standards that are higher than EU or WHO requirements. As part of the accession process, individual EU countries have negotiated required wastewater treatment standards and transition periods for compliance, delaying agreed standards enforcement. EU candidate countries have effluent standards that are comparable to EU requirements, but generally have not defined sensitive areas and the related wastewater treatment requirements. Moldova and Ukraine are still mostly applying Former Soviet Union treatment standards, which are, nominally, not lower than EU requirements either. 83. The level of customer metering, an important demand management tool, has been steadily increasing to near-universal coverage in many countries (Figure 36). Although metering of individual customer’s consumption was not an established commercial practice in most countries in the early 1990s, it has been established as an important component of effective demand management and a fair way of distributing costs among consumers. 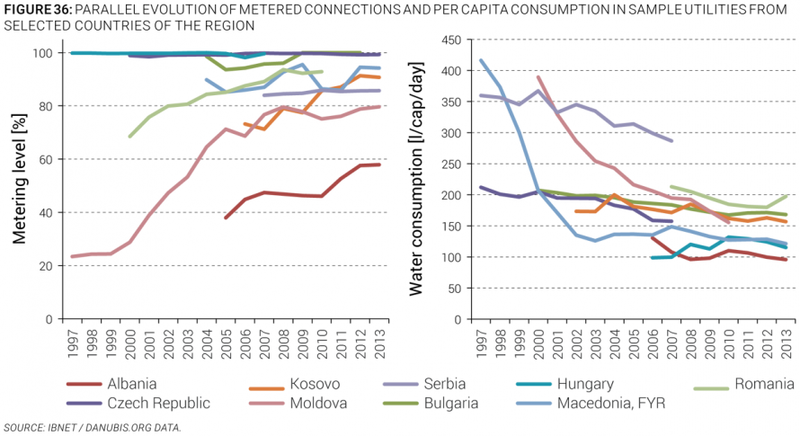 At the present stage, for those countries for which information is available, only Albania and to a lesser extent Ukraine do not have metering levels above 80 percent, and in both countries metering efforts are underway to further increase the percentage of metered connections. A particular challenge in some countries of the region is the fact that metering, when present, is done at the building rather than the apartment level, so the metering rate is somewhat overestimated in the sense that it does not measure whether all end-users have a meter, but only whether the billing takes place on the basis of a meter reading—even if to be further split among apartments based on surface or number of residents. 84. Conversely, individual consumption has followed a steady downward trend. 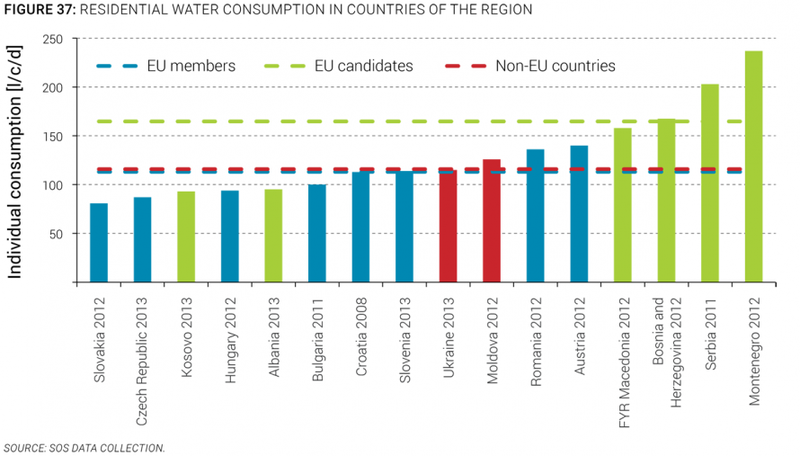 Due to the increase of individual metering, increasing tariffs, and the decrease in industrial activities throughout the region, overall consumption of water per person has decreased over the last 10 years and is stabilizing around EU-wide standards of 100 liters per capita per day to 120 liters per capita per day, with notable exceptions particularly among countries of former Yugoslavia, such as Bosnia and Herzegovina, FYR Macedonia, Montenegro, and Serbia (Figure 36 and Figure 37), where tariffs are also among the lowest (see Chapter VI). As tariffs continue to increase and apartment-level metering spreads further, it can be expected that individual consumption will continue to decrease in those countries where it is still relatively high. Acknowledgments. This work is a product of the staff of the World Bank, with external contributions. The findings, interpretations, and conclusions expressed in this work do not necessarily reflect the views of the World Bank, its Board of Executive Directors, or the governments they represent. The World Bank does not guarantee the accuracy of the data included in this work. The boundaries, colors, denominations, and other information shown on any map in this work do not imply any judgment on the part of the World Bank concerning the legal status of any territory or the endorsement or acceptance of such boundaries. Rights and Permissions. The material in this work is subject to copyright. Because The World Bank encourages dissemination of its knowledge, this work may be reproduced, in whole or in part, for noncommercial purposes as long as full attribution to this work is given. Any queries on rights and licenses, including subsidiary rights, should be addressed to the Office of the Publisher, The World Bank, 1818 H Street NW, Washington, DC 20433, USA; fax: 202-522-2422; e-mail: pubrights@worldbank.org.